Burlyman's GEORGE BARRIS 1966 BATMOBILE CAR Video Clip! 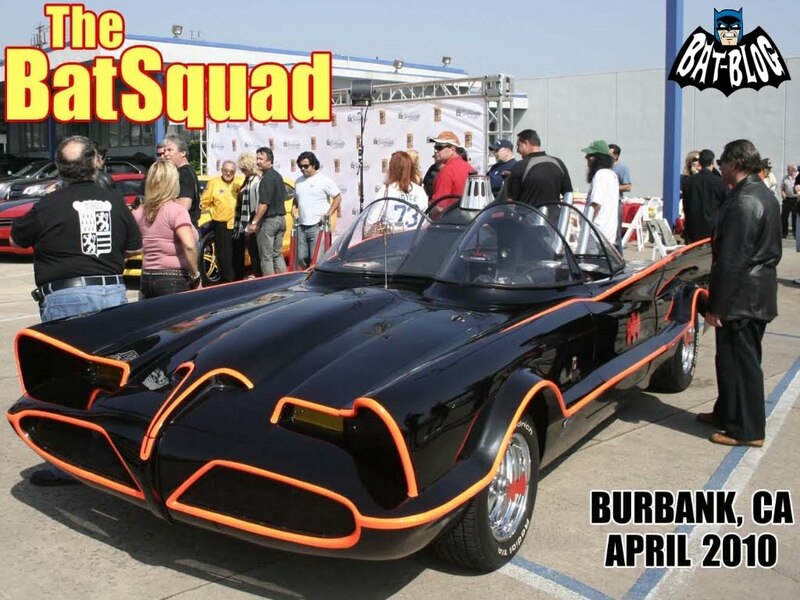 Remember that post we did recently of when our friend "Burlyman" went to see George Barris & his 1966 Batman TV Batmobile Car in Burbank, CA? ( Here's a link to check it out, click HERE! ) Well, he also shot some super-excellent video!! I always love seeing this Classic Custom Car, it's so cool! 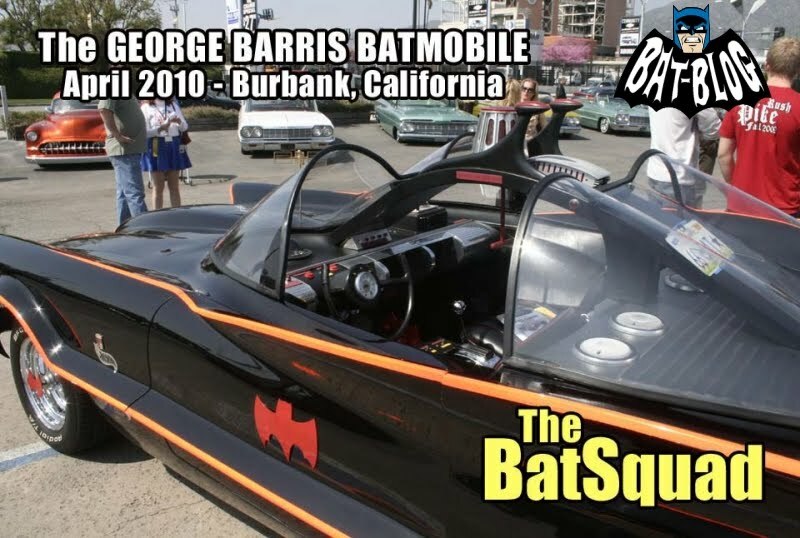 Plus, it's really great to see George Barris again. He looks like he's in very good health, that's nice. Thanks to Burlyman for sending this video clip, YOU ROCK, Sir! Our buddy, THE BATFAN, sent us some cool photos the other day of a few rare bat-items from his personal collection. 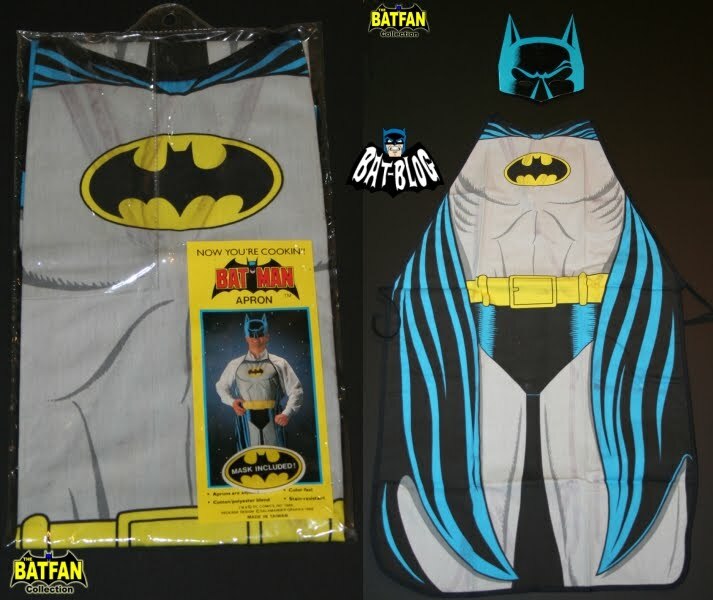 The 1st pic shows a funny BATMAN COOKING APRON that was made around the time of the 1989 Batman movie. 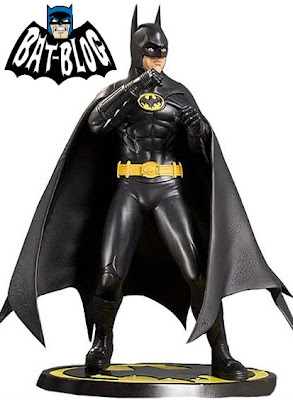 I like that it's the "Comic Book" version with the blue/gray/yellow bat-suit. The funny thing about it is that they made a mask to go with it! I actually remember this thing when it was out. I now wish I would have bought one, it's pretty cool! The next group of items are really great too. They're a Set of Batman & Robin Drinking Glasses that were made around 1967!! What makes them extremely hard to find here in the US is that they're from the Netherlands. Yes, all the way from Holland!! I totally love the retro-style graphics, very beautiful! ( Please click on the photo for a larger, more detailed, picture ). 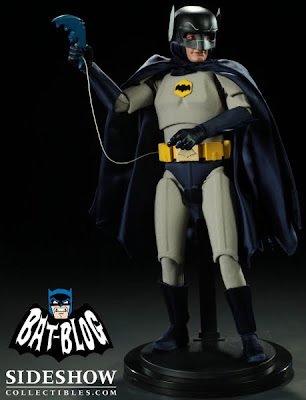 Do you have any obscure super-rare Batman items in your collection? If so, then please shoot us a pic today. Our email is always on the top right-hand side of this page. 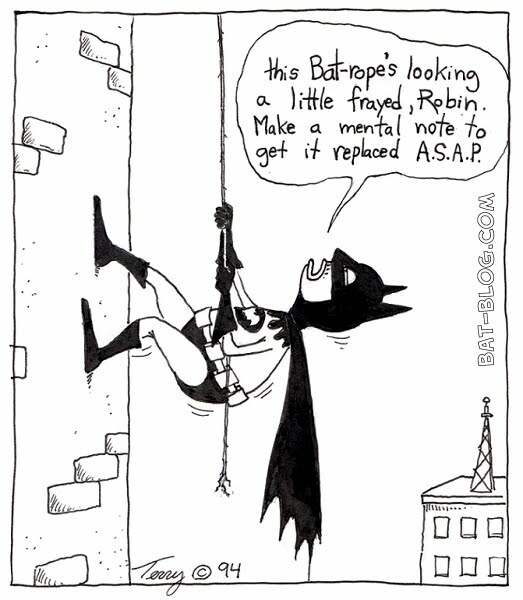 Funny BATMAN PARODY Comic Strips! 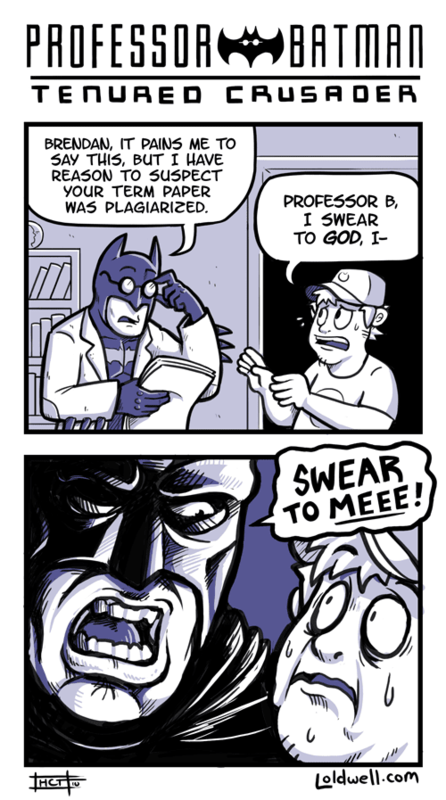 Here's a few random Batman-related Comic Strips that have been sent in by some awesome Bat-Blog Readers lately. They're all completely hilarious, ha ha ha! ( Thanks to everybody to send them in ). Awesome BATMAN 1966 BATMOBILE TATTOO Art! I think it's actually been awhile since we posted a Batman Tattoo but as soon as I saw this one I knew we had to feature it here. I contacted the owner & he was kind enough to allow us to post it. His name is Steve & this beautiful piece of art was done by a Tattoo Artist named Matthew Ward. It's a wacky-crazy graphic of Batman in his 1966 Batmobile "George Barris" Car with missiles shooting out of the back!! I say "wacky-crazy" because it's sort of done in the vintage 1960's "Rat-Fink Style". See how Batman is wayyyy bigger than the car & the gearshift knob is really huge? Plus, the tires are smokin' like crazy! This is really great &, as a tattoo, totally original... I love it! Thanks to both Steve & Matthew for allowing us to post it. You guys did an awesome job on it & I know many Batman Fans are going to completely love seeing it! One last thing, if any other Bat-Blog Readers have recently got some ink done then please shoot us a pic, our email button is always on the top right-hand side of this page. 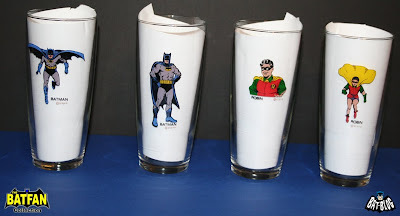 I love when creative people become inspired by Batman & make a few items to decorate their house with, that's cool! Here's some photos sent in by a Bat-Blog Fan named Ben showing a few things that he & his Girlfriend have crafted. 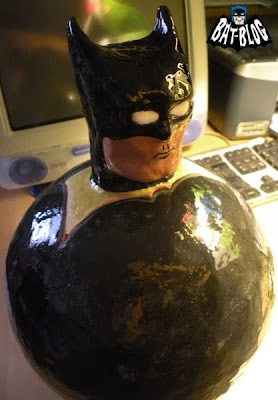 The 1st one shows a Batman Effigy Pot they made. Now, I think this thing is totally cool visually but I was wondering, "What is an Effigy Pot?". So, I did some quick research & found out that "Effigy Pots are Jars, Bowls, Bottles or Vessels made in the shape of humans or mythological figures. They have been made for 1000's of years & are thought to have healing powers". Cool! 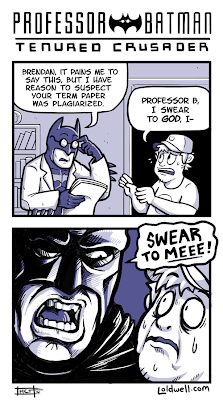 I guess some Bat-Blog Readers are gonna learn a little Art History today, I did, ha ha! The next item is something most of us are pretty familiar with. It's a large Stained Glass Window piece & this one has a beautiful Bat-Symbol Logo on it. To be specific, it's the one from the current Christopher Nolan movies ( Batman Begins & The Dark Knight ). This thing is awesome! I bet if this were hung somewhere that sunlight could shine through it it would be really striking. Actually, both items are really really great & I want to thank Ben for sending these pics into us. You guys made some very cool stuff! VINTAGE BATMAN TOY PHOTO - 1966 Punching Bop Bag! 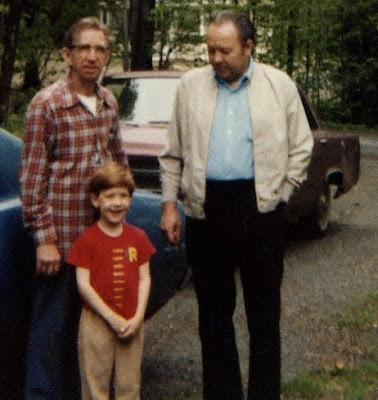 Here's a totally cool vintage 1970's family photo of our friend David when he was a little boy. 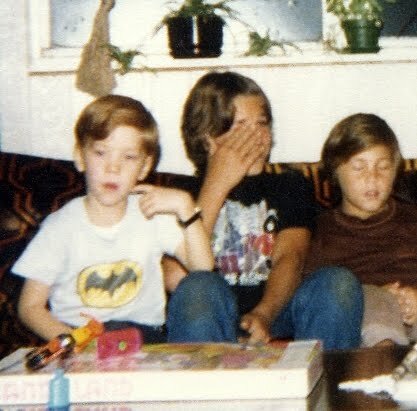 He was completely into Batman back then & still is today. 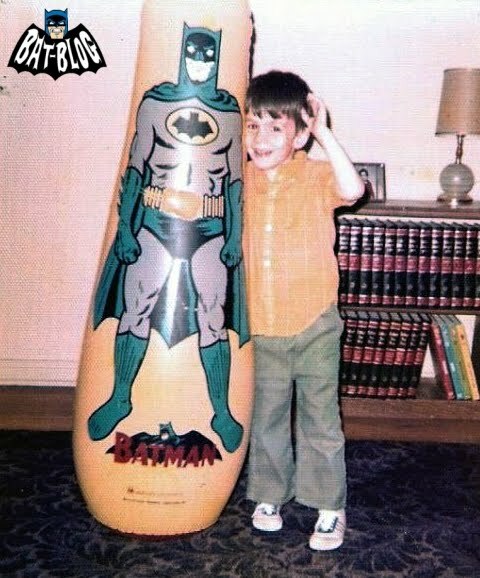 The toy shown here is the 1966 Batman Punching Bop Bag. Now I have to wonder why they didn't put the JOKER on here instead because who would want to punch Batman? ( ha ha ). Oh well, I still think the retro-style graphics are AWESOME! Many thanks to David for allowing us to post this wonderful piece of Bat-History. Speaking of that, be sure to check out this older post on the Bat-Blog where we show a few vintage toy catalog scans that feature this same exact toy, just click HERE! 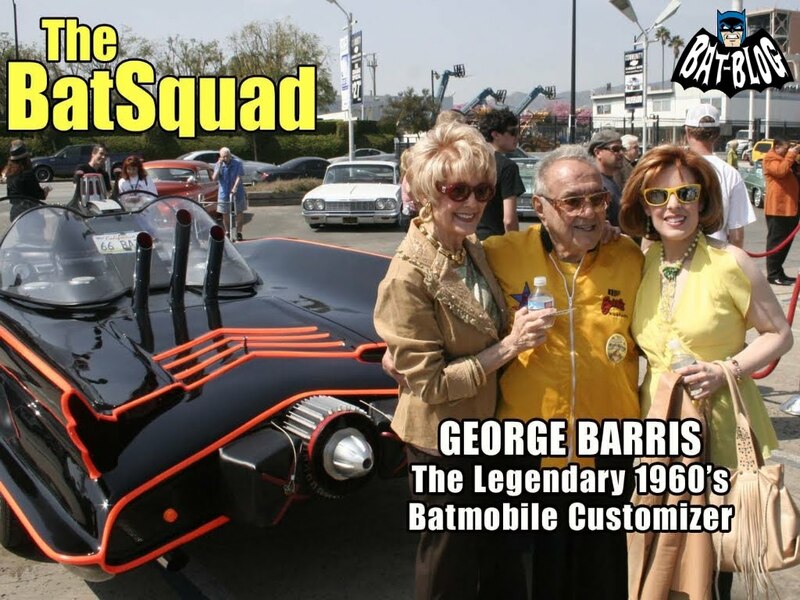 Photos: GEORGE BARRIS & His Amazing Batman TV Show BATMOBILE Car! OK, now how awesome is this?! 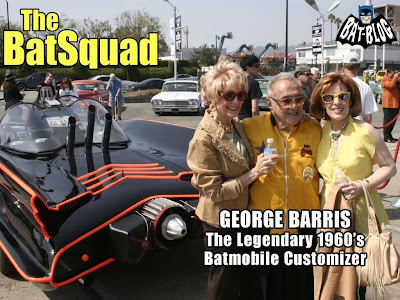 Awhile back the Bat-Blog we reported that George Barris was going to be at a public event in Burbank, CA with his '66 TV Batmobile Car. It was to promote the new Chevrolet Camaro he designed. Which would have been so cool to see but the great thing is that we got some really nice pics from the event! Yes! 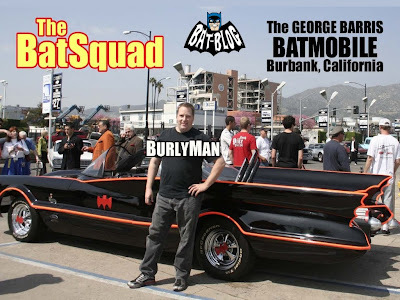 A Loyal Bat-Blog Reader named Dave, who lives in New York & is a part of The Bat Squad ( a group of Cosplayers who are totally into Batman ), has a friend named "Burlyman" who lives in California. So, Dave asked his friend to get some photos while he was there, that's AWESOME! Now, the pics are really good & a few of them have been made into "1966 Batmobile Wallpaper Backgrounds" you can use to brighten your desktop ( the first 3 photos ). When I say "good" I mean he got some great shots from every angle! One of them even shows the interior, it's always cool to see the inside...it always makes me want to drive it, ha! 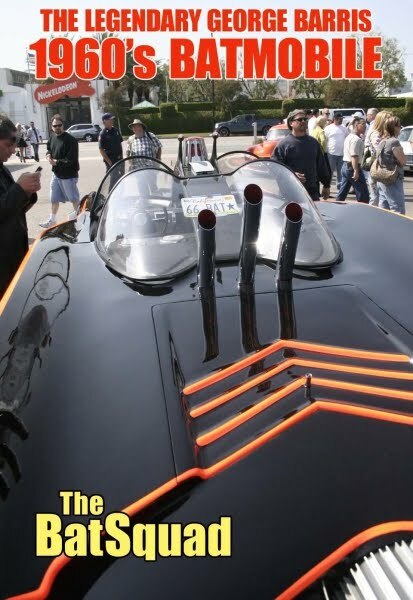 Plus, there's some nice shots of the King of Kustom himself, George Barris. What a trill this must have been! I wanna thank both Dave & the "Burleyman" for sending these wonderful photos...you guys ROCK! Hey, wait a second, I just realized... there's NO pics of the Chevrolet Camaro! Ha Ha, I guess "Burleyman" was so excited about the Batmobile that he didn't care about the other car, that's funny! But I can't blame him, if you're a Batman Fan your brain sort of totally short-circuits when you get near this car. I know that personally I probably would have cried like a little girl. OK, ya gotta admit that even though this Custom "Batman Stormtrooper" Toy is very unusual, it's extremely well done! It's a work of ART. In fact, I think it's totally hilarious! This large figure was part of the recent "Sideshow Collectibles Art Trooper"custom project. 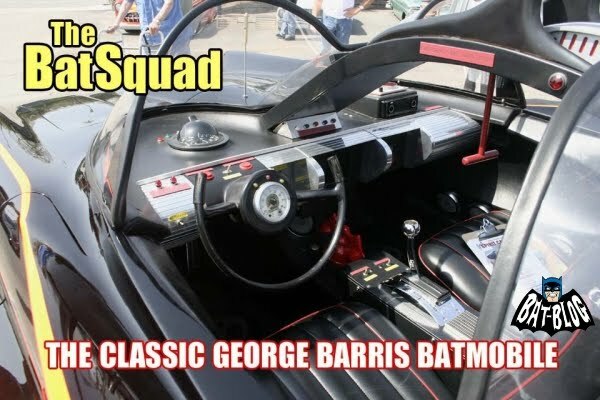 It's a mash-up of the 1966 Batman TV Show & 1970's Star Wars Movie! It's like Adam West meets George Lucas, ha ha! I only have one picture here but a photographer named Tim Hanson did an amazing set of photos of this doll that you can see on Flickr, just click HERE! Back in 1988 Adam West appeared on British television's TV-am. He was there to discuss a "possible Batman movie" that could be made. I think he sort of knew that the 1989 BATMAN film was in development & he really wanted the part. Of course we all know that Michael Keaton ended up getting the role. The interesting thing here is that Adam West thought the new movie should be "darker" or "more modern". I woke-up this morning to some very cool Batman pictures in my email box, that's always awesome! They were sent in by a Good Bat-Blog Citizen named Batmobilly. He shot some pictures of a few posters he has had professionally framed & they look really GREAT! ( Be sure to click on them for larger examples, they're really cool close-up ). 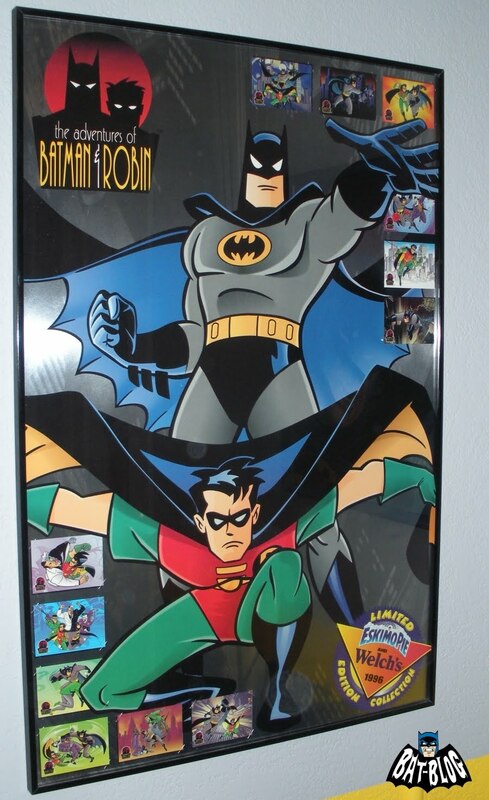 The 1st one is a poster from Eskimo Pie & Welch's Fruit Pops when they had a tie-in promotion with "The Adventures of Batman & Robin" TV cartoon back in 1996. If you remember, you could get some trading cards on the back of the box & there were 12 different ones to collect. This poster was a mail-away item. I totally love the graphics on here because that TV series was so wonderful. 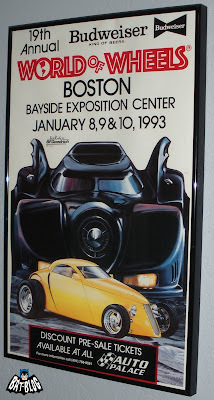 The next poster advertises a Hot Rod Car Show event they had in Boston called "The World of Wheels". 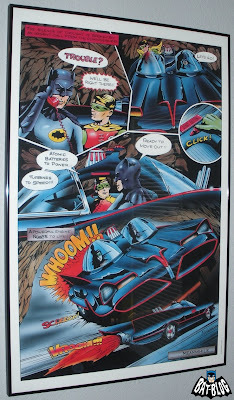 It's from 1993 & features a bold picture of the Batman movie Batmobile car! That would have been pretty cool to go to. 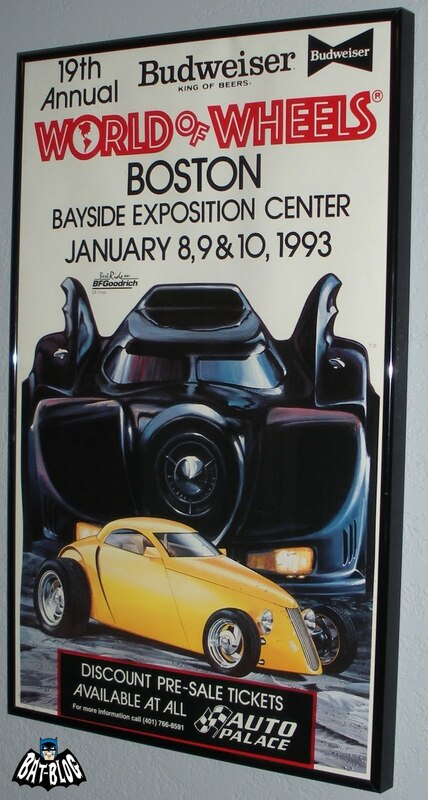 Now, here's a unique piece of Bat-History, this poster was once accidentally shown on the "Home Improvement" TV Show. It happened when Tim Allen's character, while on a road trip, stops at a convenience store to ask for directions. 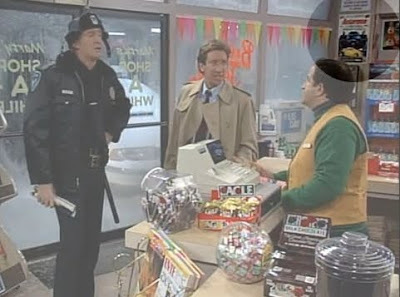 The episode was called "You're Driving Me Crazy, You're Driving Me Nuts". Now, check out the last poster here. 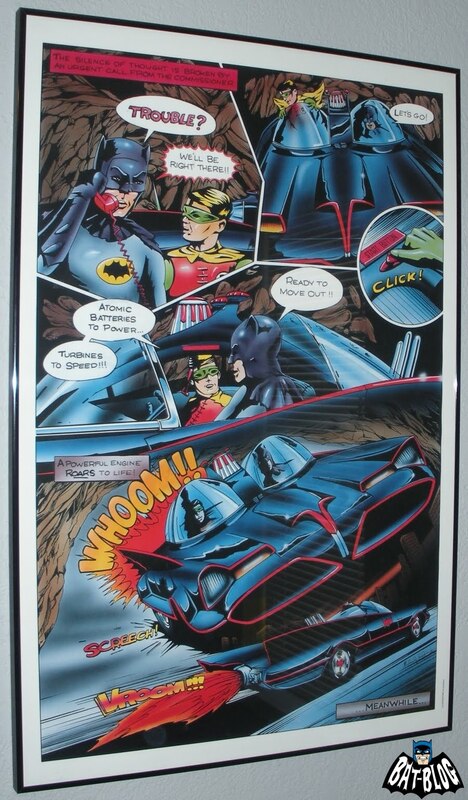 It's a comic book-style image of the 1966 Batman TV Show when they're firing-up the Batmobile. You know the scene, "Atomic batteries to power, turbines to speed. OK, ready to move out!". Wow! I wanna thank Batmobilly for taking the time to shoot these incredible photos. I gotta admit that I have never seen the last 2 posters here. But, sharing the love of collecting cool Batman stuff is really the main focus of the Bat-Blog! My Friend Meets Batman Voice Actor KEVIN CONROY in Chicago! OK, I'm totally jealous here!! While on Facebook the other night I thought I would go over to my friend John's page to see what he's been up to lately & say, "Howdy". Well, when I got there he had just posted this really great pic! He recently went to that C2E2 Comic Book Convention in Chicago. I really really wanted to go to this thing but couldn't do it this year. 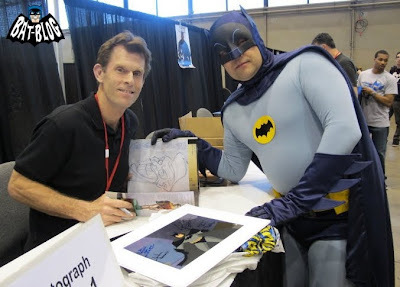 Anyway, while he was there, he got to meet KEVIN CONROY!! Yes, the Voice Actor who created Batman's voice for the Batman: The Animated Series TV Cartoon, the Arkham Asylum Video Game, etc...Batman! Now, just to clarify, Kevin is on the left & John is the guy in the bat-suit, ha! 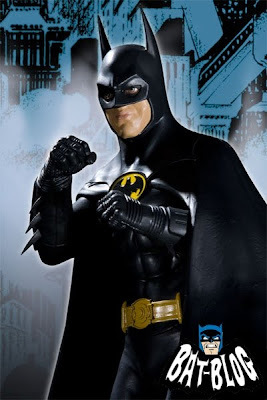 Yes, John also has an extremely amazing 1966 Batman TV Costume, Adam West Style! He said that meeting Mr. Conroy was a total thrill & I believe it! I've heard that he's very gracious & overall a pretty nice guy, that's cool. Plus, in my own personal opinion, he's the greatest "Batman Voice" out there! Thanks to John for allowing me to publish this wonderful photo, I'm still jealous! 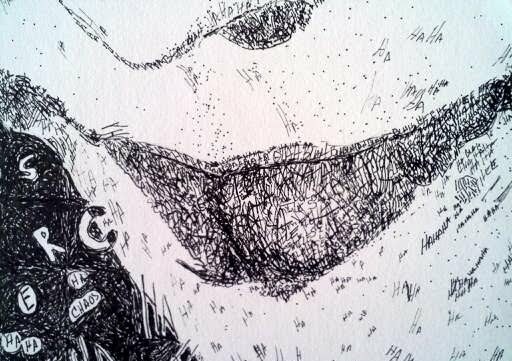 This drawing was sent in by a loyal Bat-Blog Reader named Kanike. She is totally obsessed with the Joker character! 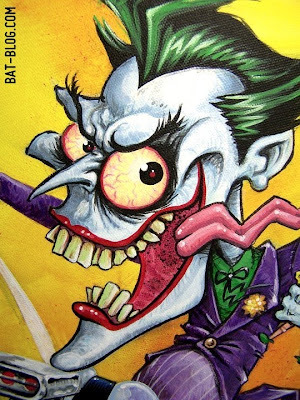 She loves all the different versions of the Joker from the comic books, animated cartoons, video games, movies, etc...In fact she has even started a blog about it called RANCID RAINBOW. 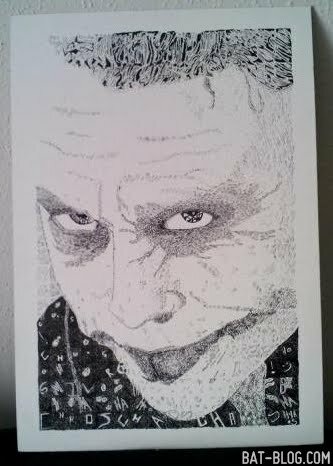 Anyways, here's a drawing she recently did of the Joker from the Dark Knight Batman movie. Of course it's the Heath Ledger version & it looks just like him. Now, overall the picture is really excellent but the neat clever thing is that the lines are mostly made-up of small words. From far away it looks like a graphic but if you look at it very close-up you'll see that they're words like "Ha Ha Ha!". For example, look at Joker's eyes...they're made with the words "Anarchy & Chaos", very cool! Now, I did mention her blog, which is all about the Prince of Crime. Here's a link to check it out, just click HERE! 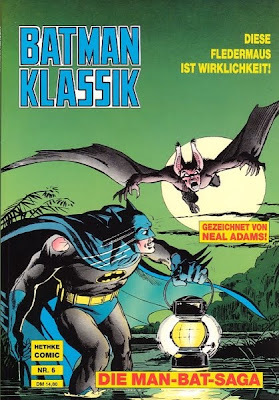 Lately I have been sort of obsessed with "Foreign Batman" comic books. They're really hard to find in the US. I like the ones that have a total foreign language on the cover. I can't read them at all, but they're cool to look at, ha ha! 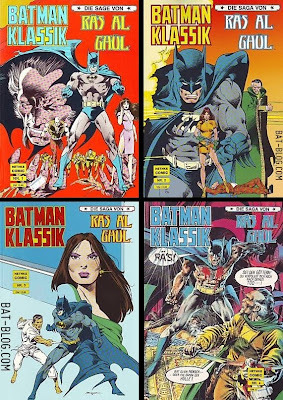 Here are a few examples of a title called BATMAN KLASSIK. They're published in Germany by the Hethke Publishing Company. This series reprinted all the classic "Neal Adams Batman" stories from the 1970's, mostly the ones featuring the characters that Neal Adams created, R'as Al Ghul & Man-Bat. I always loved those stories from my childhood so they're kinda great to see in another format. If there are any Bat-Blog Readers from other countries who could send some information or photos that would be great, thanks! 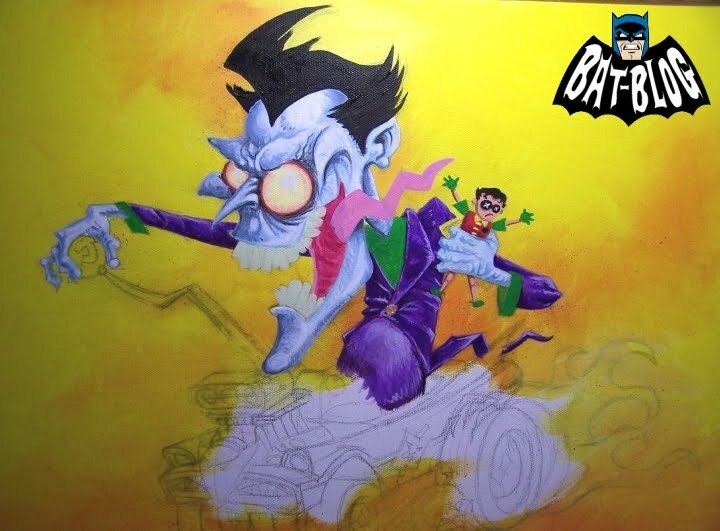 OK, I know I'm on sort of a "Batman-inspired Art Kick" recently but we have been getting a ton of cool submissions from Bat-Blog Fans. Plus, I can't help it that my readers are smart, creative, talented people ( ha! ). Here's a great example of that creativity in action. This Pop Art Painting was done by our good friend Chris Mason. It shows "The Joker stealing the '66 Batmobile". 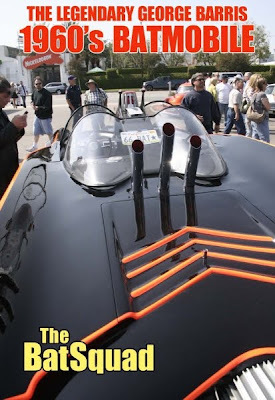 You know the car, it's the George Barris Custom, otherwise known as the 1966 TV Show version, a total fan favorite! 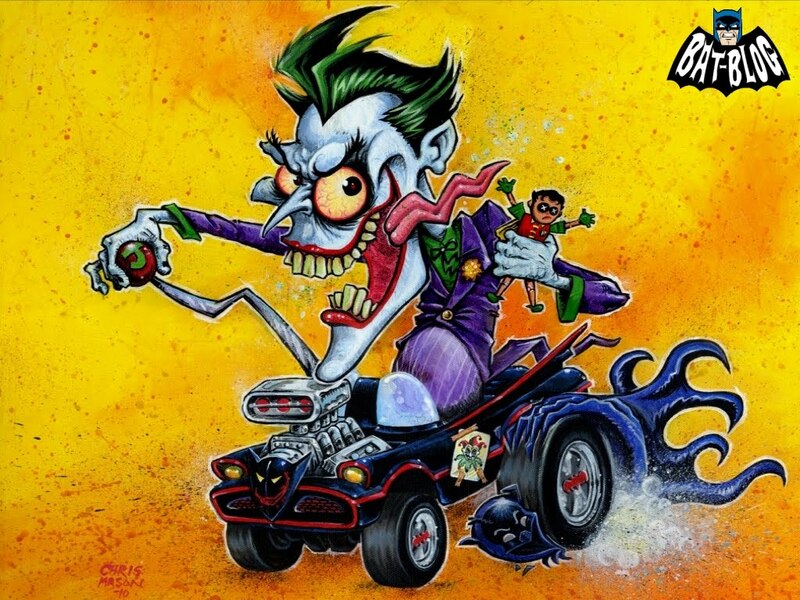 It's done in that famous Ed "Big Daddy" Roth style that was originated in the Hot Rod Culture of the 1960's. Just think about those old vintage "Weird-O's" toys & model kits. Then you'll know what I'm sayin'! But regardless, the artwork here is just totally great! Actually, I mean to say... completely beautiful! The pictures shown here sort of explain their selves but basically you have a close-up detail shot ( the 1st pic ), a nice picture showing the work in progress, then some photographic proof of Chris actually doing the painting ( in case you don't believe us, ha ha! ), & finally the completed work. Now the last graphic, showing the final artwork, it's BIG enough ( if you click on it ) to be made into a Wallpaper Background for your PC. Yes, that's a bonus! Not only do you get some beautiful eye-candy to look at but you also receive a souvenir of the special moment. 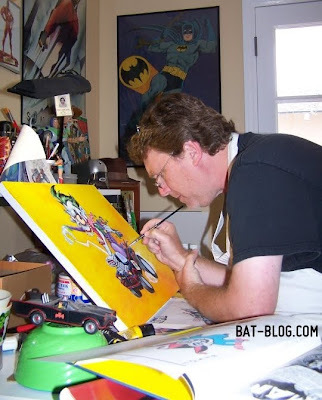 Yeah, the Bat-Blog is pretty awesome, I know ( just kidding ). Actually if you'd like to see more of Chris' work you can visit his Facebook page by clicking HERE! The only problem is I think you have to be a member to sign-in to see it but it's all worth it. Plus, if you're a member ( or become a member ) you should join the Bat-Blog while you're there, our link is the button down below. Please join us! Leon's 1966 BATMAN TV SHOW HOMAGE Pop Art Paintings! 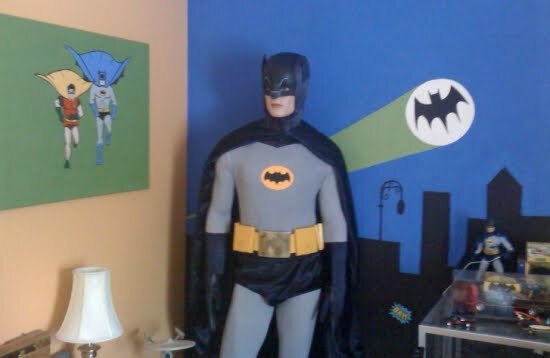 OK, Does everybody remember when we showed our friend Leon's amazing 1966 Batman Bat-Suit Costume he made & the cool manikin he found to display it? He even went on to create a wall mural as a background for the thing, it's really cool! Well, it looks like he hasn't stopped there! 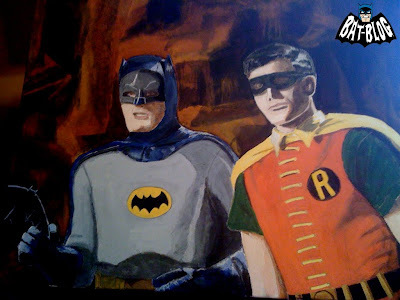 Shown here are 2 extremely awesome POP ART Paintings that have been done with imagery from the classic 60's TV Series. 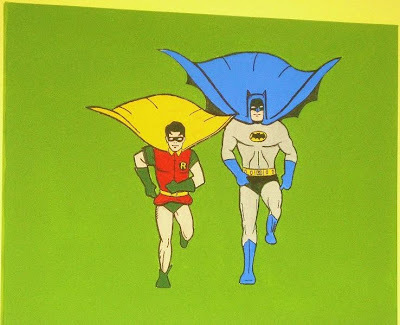 One of them looks like a color photo showing Adam West & Burt Ward in costume on the set. The 2nd one is an image from the animated intro to the TV show. They're both really well done. Thanks Leon for keeping us up to date on this project, you guys are doing super-great stuff here! The other night, on Comedy Central's SOUTH PARK Cartoon TV Show, they did a total homage to Alan Moore and Brian Bolland's classic Batman Graphic Novel JOKER: THE KILLING JOKE. Yes, the ultimate JOKER book! One important thing that true Batman Fans will love too is the fact that they used the original version of the book & not the 2008 re-issue. Now, I have not seen it yet. In fact, our friend Dan was the guy who told me about it & to torture me he sent these amazing screen shots ( Thanks Dan! ). As you can see, they do a spot-on parody of the book! Be sure to click on them for larger versions. I have been trying to find the episode online & that's turned into a small problem. You see, the creators, Trey Parker and Matt Stone, are under a lot of trouble right now because this episode depicts an image of the Prophet Muhammad & it has a lot of very serious Muslim groups pretty angry. Like, usually after a South park episode has aired ( & you missed it ) you can visit their website a few days later to see it online. Well, this episode is the one under fire from religious groups & they might not ever post it there. Stay tuned to the Bat-Blog for more details. I know a lot of Batman Fans will totally love this graphic. It's done by none other than the famous comic book artist Jim Lee. 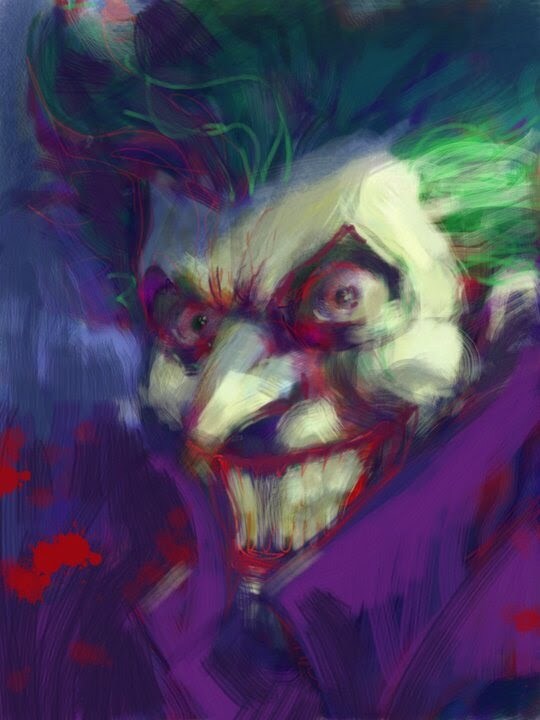 He drew it on an Apple iPad & I think it's pretty awesome! What do you think? Please leave a comment & let us know. John's Vintage BATMAN AND ROBIN Family Photos! Here are 2 totally cool photos showing our friend John way back in the day. In the 1st one, he is wearing his awesome Robin, The Boy Wonder T-Shirt. In the next picture he's shown wearing one with a Batman-Logo! 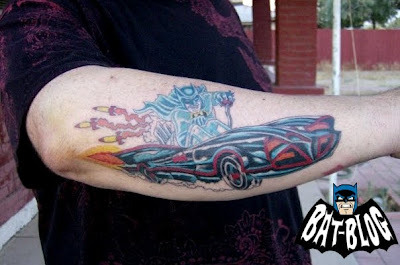 OK, now that's loyalty right there... a true Bat-Fan! Remember, we always love getting old photos like this so if you have one then please send it in. Our e-mail button is always on the top right-hand side of this page. Oh yeah, one last thing, our gratitude goes to John for sharing these great pics...Thanks John!